1994 Mustang - specs,performance,parts,how-to information. 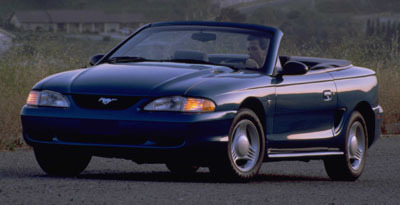 The 1994 Mustang was a breath of fresh air to an aging pony car. Finally there was something new to celebrate and for good reason. This car was all new. Gone was the tried and true, but dated fox body and chassis. The new platform was based on Ford's new SN-95 or Fox-4 Platform. From the new aerodynamic body shape to the slightly longer wheelbase ( from 100.5" to 101.3" ) the 1994 Mustang was new in almost every way. On the drawing board was increased chassis stiffness and a revised suspension that could carry it into the next decade. 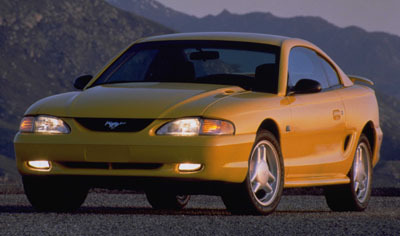 The 1994 Mustang had a new and more aerodynamic shape, which brought it up to date with other Ford family styling at the time It incorporated a more rounded nose and gentle curves into the rear tail. The front nose and valance were made more compact and shapely and integrated into what was once the grille opening. The tradition of the long hood small back design was retained and a new molded headlight and turn indicator assembly gently curved around to the sides of the front fenders. And back from a long hibernation, was the the Mustang pony logo, signaling that this was a pony car that could really be proud of its vintage beginnings. The new GT sported molded in rectangular fog lights in its new bumper. A new Cobra was introduced and were easily identified by their distinctive integrated round fog lights pushing out at the edges of the front bumper facia. With an all new body and chassis came a long overdue change in the interior. Matching the new aerodynamic and smooth edged body shape, Ford designers carried the rounded shapes into the interior. Gone was the blocky steering wheel center and the truck like instrument panel( have a peek at an early 90's Bronco or F350 and you'll see what I mean ). The center console was retained, yet became a logical part of the new curvy interior. Ford finally woke up to the fact that just because you didn't want or couldn't afford a V8 didn't mean that you wanted a car that couldn't make it up a steep driveway. And the 94 Mustang finally had a base motor that was strong enough on its own to help shed that grocery getter image. The new base engine was a 3.8 Liter sequential electronic fuel injected (SEFI) V6 which pumped out 145 horsepower. Compared to the V8 offerings, this may not seem like much, but considering the fox body v8's of years past could do no better, this was something of a miracle! The roller cam equipped 5.0 liter engine continued to produce a slightly lower 215 horsepower, while the beast of the family, the 5.0 liter Cobra motor introduced a year earlier, churned out a very respectable 240 horse power, an increase of 5 hp from 1993. Ever had to work on a starter on a 1994 Mustang? Things are a bit packed in that engine compartment and the access to the starter is interesting. My last experience tracking down a possible short, led me to finding an access hole inside the passenger side wheel well which seems to be absolutely necessary if you want to disconnect the starter wiring. Unfortunately, my discovery didn't happen until large quantities of skin and blood were lost.... hope you have better luck.